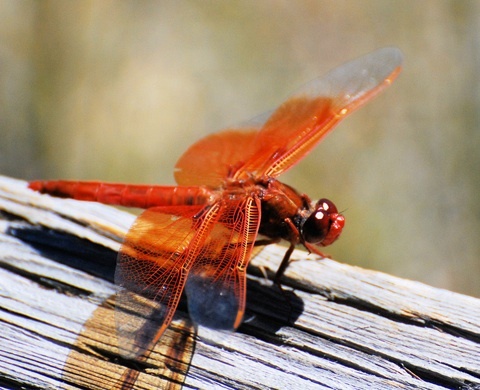 One day, as my seven year old stepson and I played by the creek, we were surrounded by dragonflies and “DRAGONHOPPERS” – that’s what he likes to call those grasshoppers that fly through the air like a butterfly. We were building “train tracks” from river rocks, and one dragonfly landed so close, it was if s/he were watching us on Animal Planet. Less than an arm’s length away, this neon orange Dragonfly and his/her big pumpkin eyes seemed glued on us. No matter that we were like giants, piling rocks or letting them splash in the water, that little dragonfly sat calmly, like some couch potato for at least a half-hour.